HOAC runs several clubs to help our members develop a range of skills. The centre runs five clubs to help our younger members continue and progress their sailing/sculling/windsurfing skills whilst having lots of supervised fun and games. For further information please contact the HOAC office on 01895 824171. This club meets on Sundays throughout the year and on Wednesday evenings from May to August. This is where you can try out Lasers and a range of performance boats. It’s also a great way to work towards sections of your PE GCSE’S or DofE Award. BR Stage 1 (Fee includes British Rowing Silver membership). During club sessions there will be an RYA Instructor on hand to provide informal advice, support, coaching, and safety cover. Windsurfing club members get use of the specialist equipment including the monofilm sails, performance windsurf boards and harnesses (ability dependent). Ideal for completing the Physical or Skills sections of the DofE Award. If you are new to the sport, don't worry. Do the Learn to Windsurf course before you join or take advantage of the special offer of £220 for Adults or £175 for Juniors. The club’s role is to encourage and support people with disabilities. We enable people of all abilities to experience the joys of sailing, rowing and paddlesports in a safe and friendly environment. Staffed by qualified instructors and volunteers, the club meets every Saturday. Both groups and individuals are welcome. To enquire about the Club, please contact the Centre on 01895 824171 or email [email protected] or [email protected]about rowability. 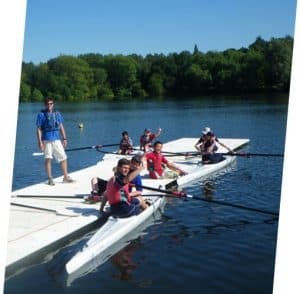 The club meets on every Saturday from 27 April 2019 to 5 October 2019 from 10.00am – 4.00pm, rowing is on from 12.30pm – 3.30pm all for a cost of £5 per session. HOAC is a Sailability Foundation Site and RYA Instructors supervise the sessions. This is a friendly sailing club, with a large fleet of sailing dinghies available, free of charge to QSC members. Off site trips are also organised by the club, further details can be found in the club newsletters. Enquire about booking these member-only events and boat parking. Please select one or more clubs you are interested in joining.